Eager to start their life together, historian Vickie Preston and Special Agent Griffin Pryce take a detour en route to their new home in Virginia and stop for a visit in Baltimore. But their romantic weekend is interrupted when a popular author is found dead in the basement of an Edgar Allan Poe–themed restaurant. Because of the mysterious circumstances surrounding the corpse, the FBI's Krewe of Hunters paranormal team is invited to investigate. As more bizarre deaths occur, Vickie and Griffin are drawn into a case that has disturbing echoes of Poe's great works, bringing the horrors of his fiction to life. As always Ms Graham has written another intriguing book, blending the paranormal, mystery and romance. While also having the great man himself Edgar Allan Poe popping in and out of the story making it really great reading. The book starts with historian, Vickie Preston and Special Agent Griffin Pryce travelling to their new home but have decided to take a short break in Baltimore for a romantic weekend. It was not to be. A body had been found in the basement of an Edgar Allen Poe themed restaurant. 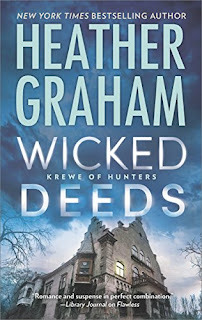 Being a mysterious death and bizarrely staged the FBI's Krewe of Hunters paranormal team has been invited by the local police to investigate and being on the spot, so to speak, Vickie and Griffin has been asked to start the proceedings. With more bizarre deaths happening Vickie and Griffin are kept busy. Thankfully Vickie's gift is giving them an insight into what is happening. With the help of Edgar Allan Poe in his ghost state reaching out to Vickie to help, this book will keep you turning the pages to see what is going to happen next. It is fast paced and spellbinding. Keeping you guessing to the end who the murderer is. You have to feel for poor Vickie and Griffin. Their romantic weekend has been turned upside down but with the deep love they share they do get to share some alone times. “Frustration is a terrible thing,” she said. “I know.” I was suffering from it. She laughed; she was in his arms. With ghosts helping to untangle these deaths and all the characters being so diverse in this book. The story is both entertaining and clever and I loved it. Great book Ms Graham. Another hit for me.